After years of speculation about whether it would ever happen, Grado Labs’ first wireless headphone, the GW100, is finally here. Even if they’re using the same Bluetooth tech used by big box brands you might be more familiar with, they’re unlike any other wireless headphone I’ve ever used. The first wireless headphones from a cult favorite. For a certain brand of nerd, Brooklyn-based Grado Labs inspires devotional loyalty. The 65-year-old family company has cultivated a following thanks to its distinctive aesthetics, stubborn commitment to its homegrown roots, and its uncompromising commitment to audio quality. 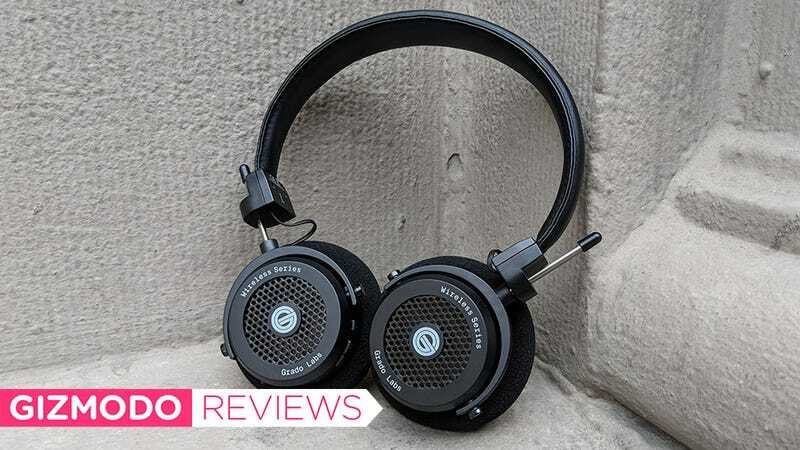 And they’ve got a headphone everyone can afford: The audiophile brand offers great-sounding products as cheap as $80 and ranging all the way up to the thousands. Grado’s slow-moving style suggested to me that maybe the company would never go wireless. But lo, after 18 months of development, the GW100 ($250) are real! John Grado, the company’s head honcho talks about making headphones in such deceptively simple terms, it sounds like almost anyone could design them. (“There’s a wire, a speaker, and a housing for the speaker.”) To me, that betrays why a full five years (at least) into the mainstream Bluetooth era, we’re only just getting our first Grado wireless cans. Grado has mastered the art of tuning simple headphones just right—why would you throw a wall of digital technology between the music source and the human? In developing the wireless product, Grado and his team had to go through several rounds of tuning the digital technology to get precisely the sound he wanted—not too bassy, with the midrange the company is known for. I’ve owned a pair of only the very cheapest Grados for a few years. They sound exceptionally good—better than many headphones that cost two or three times as much. You don’t put the headphones on so much as you are absorbed into them. They reproduce remarkably clear and detailed sound owing in part to their open-back design. By not sealing off the earcup, the driver moves more freely. In using the GW100s over the last week, I’m reminded of that feeling of being fully immersed in music. One day I plowed through a stack of new records I wanted to listen to in a variety of genres. Cat Power’s delicate vocals on Wanderer were clear and humanly rendered. Meanwhile, the headphones dutifully handled High on Fire’s punishing thrash metal without flinching. My go-to song for checking out bass is “Auntie’s Lock/ Infinitum” by Flying Lotus; its oozy low-end synthesizer lines are devilish for audio products of all kinds. And though Grado prides himself at not having followed the crowds to products with exaggerated bass, the headphones push air down there and capture the nuance of the song’s bulbous tones. I could go on and on, but suffice it to say that yes! The headphones sound good! Super good! To my decent ears as good as anything I’ve ever heard that doesn’t drive the price north of $400. Given the company’s pedigree, that’s not super surprising. There are drawbacks, of course. In case it hasn’t come through yet, the GW100s are an incredibly barebones product and don’t provide any of the perks or conveniences of our very favorite wireless Bluetooth headphones like the Bose QuietComfort-35 II the Sony WH-1000XM3. There’s no noise reduction technology, no EQ modes, or companion app. Heck, you can’t even connect them to more than one source device at a time. If you want to switch from listening from your computer to your phone, you have to disconnect the headphones from your computer, turn off its Bluetooth, or go out of range to get the headphones to go into pairing mode again. While the Bose and Sony headphones are clearly designed with the comfort and durability needs of frequent travelers in mind, the GW100s seem better suited for your desk or easy chair. The headphone’s design looks very similar to Grado’s affordable Prestige series headphones. (According to Grado, the GW100 isn’t based on any specific wired product. It’s a fresh design.) While it’s nice that the headphones have that iconic look, and they’re quite lightweight, the plastic and thin metal construction leaves me feeling nervous when I cram it in my backpack. Notably, the headphones did survive a five-foot fall from a gym locker with only a little scrape to the finish on the bolts attaching the earcups. Another sticking point is the foam earpads that ship with the headphones. It’s cheap stuff that feels scratchy on your ears, and don’t stay attached. If you throw the headphones in your bag, be prepared to root around to fish out the earpad that’s fallen off. They are very lightweight, so I was able to wear them for a long time, and I didn’t mind the scratchiness too much. One of the main downsides of open-back headphones is noise—you hear a lot of the outside world, and the sound of the headphones likewise leaks out. (Amusingly, Grado himself sees this as a feature, not a bug: “You make ice cream—ice cream melts.”) On this model, the company has done some clever engineering to reduce leakage without sacrificing the benefits of the open-back design. And it works. My old Grados would annoy my coworkers, and they can’t hear the GW100s. The problem of sound from without hasn’t been fully resolved. I could still hear the idle rumble of an ice cream truck over heavy metal and the roar of a subway train rolling into Union Station made it hard to hear Nirvana. The headphones did well walking around the city and though there were drop outs in big wide open spaces, as there usually are with Bluetooth headphones, it wasn’t so annoying I couldn’t use them. 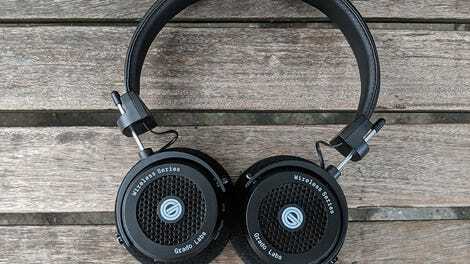 Grado says that depending on how these headphones do (“We’re on pins and needles”) the company plans to add more products to its wireless line, including potentially some higher-end models. As of right now, the only plan he’ll disclose is for an in-ear model with noise reduction to be released next year. So where does that leave us? If you’re the type of Grado consumer who is really into the company’s more affordable products, you’ll love these too. They hit every note, both in terms of sound and aesthetics, that fans have come to appreciate from the brand. That said, like all Grado products, they’re not for everyone: They’re finicky, uncomfortable, and don’t block outside sound well. But as someone who wondered whether the venerable Brooklyn audio brand would ever go without wires, I’m stoked they finally have. Noise leakage has been significantly reduced compared to other Grados. Very lightweight, but also potentially not very durable. Earpads are scratchy and constantly pop off.